Let's start with the big news. Many of you know of China's Ma Long, currently world #4 but #1 in the world for nine months last year? Well, Ma Long was at the Maryland Table Tennis Center last night, as a guest of Cheng Yinghua. I played a challenge match - and beat him, 3-0! We're not talking hardbat or sandpaper - we played with regular rackets. Okay, it was Ma Long's 9-year-old namesake, a student of Cheng's. But it was fun to beat him! One thing I found important when practicing or coaching became almost a mantra for me. The mantra was, "Practice everything, but focus on strengths and weaknesses." The idea was to develop overpowering strengths that you can dominate with, while getting rid of any weaknesses. Some players tend to focus on their weaknesses, often getting so overly critical that it's all they think about. They forget that matches are usually won by a player dominating on something. You can't do that unless you develop something to dominate with, and then develop your game around it. In particular, focus on developing both that strength and the shots that set it up, especially serve & receive. First we have the serve of China's Wang Hao's serve in slow motion. He was #1 in the world most of 2008-2009, and is currently #2. Notice the last-second sudden motion, where he can contact the ball with the racket going either way? This is no different than how a shakehander would do this serve. Also note a few back-of-the-racket serves. Have You Practiced Your Serves or Shadow-Practiced Your Strokes and Footwork Today? So says Dr. Wendy Suzuki on this news segment from ABC News. Includes play at the NY Spin Club, short interviews with actress Susan Sarandon and NY cadet Alex Lipan (U.S. #6 under 12, #1 in NY), and cameos by top player Tahl Leibovitz and NY Times puzzlemaster Will Shortz. As noted in a previous blog, this keeps popping up. We switched the site to a new plan, and the site should be faster now. Is it? Table Tennis in the Superbowl! Yes, it was - did you see the 30-second Xfinity ipad ad? It ran twice, with the short table tennis sequence at the start as an example of things you could watch on the ipad. 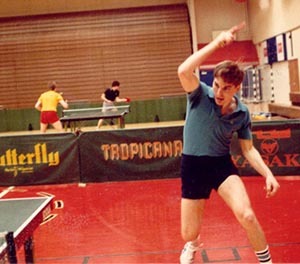 Was this the single largest "showing" of table tennis in history? I was thinking about this myth recently after losing *another* match on a series of nets and edges. To be specific, in the fifth game of a practice match, I was up 3-1, and my opponent got two edges in a row, and shortly after followed with another edge and two nets. I got zero nets or edges that game. Many coaches and players say "it all events out," but it really doesn't. Certain styles get more nets and edges than others. Hitters and blockers (especially those with dead surfaces) tend to hit with a lower trajectory, and so they get more nets. They also tend to hit deeper on the table, since they don't have topspin pulling the ball down, and so get more back edges. Blockers who block at wide angles get more side edges. On the other hand, loopers hit with a higher trajectory, and their topspin tends to pull the ball down shorter, and so they get fewer nets and back edges. Steady, precise players also tend to get fewer nets and edges. So yeah, style matters. It doesn't even out. Sometimes the site seems slow to me. Let me know if you are having trouble with this. The last thing I want are a world full of table tennis players and coaches staring at a screen in impatient disgust. Impatient disgust should only be employed when you miss an easy shot to lose a match at the Nationals, and realize it'll be another year before you are national champion. Here they are. As usual, they got a lot done. As usual, I don't see anything that'll lead to the large membership increase so needed by our sport. At the USATT Strategic Meeting 17 months ago, our 8000 membership was deemed a "round-off error," and there was a consensus that drastically increasing it was our top priority. That won't happen without a nationwide system of leagues and the systematic development of junior programs (i.e. recruit and train coaches to set up and run them). Or we can sit around and wish for it to happen really hard. 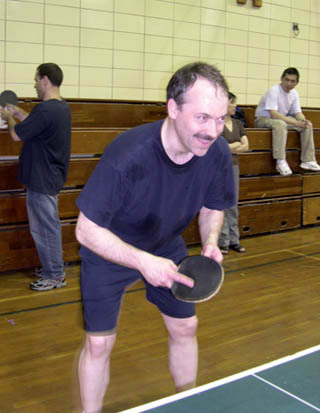 We now know with absolute certainty that the term Table Tennis overtook Ping-Pong as the primary name for our sport in 1940. How do we know this with such unflagging absoluteness? Why, from the Google Books Ingram Viewer, of course! Put in your own words, and see what comes up.